There are two things you need to know about Ohio hunting land for sale: 1.) It’s a hot commodity (seriously, look – it has the potential to provide investors with a 5-10% return, annually); and 2.) To maximize your property’s ROI, you need to know how to prepare your hunting land and improve its appeal. Skipping over the first fact – because you probably would not be reading this article if you didn’t already own land – let’s talk preparation. Hopefully, you’re okay with getting a little dirt on your hands; when it comes to leasing or selling your land, you may find yourself doing a bit of “digging” in the dirt. Hunters are looking for game, obviously. But the important thing to note here is that you need to have land that is ideal not just for hunting, but also for animals to live. Enriching your hunting land for sale in Ohio to make it a habitat for wildlife is the first step you need to take to ensure your land is ready for hunting. Top Needs for Game Management: Animals need four things: food, water, cover, and space. Your property, if well managed, can provide all of those elements. Pro Tip: Avoid letting people over-hunt while your property is for sale. Over-hunting will cause a rapid decline in your animal population; you won’t have enough animals that can reproduce and replenish your game supply. This will obviously deter potential buyers. There is a thin line between doing too much and too little when it comes to land management. After all, animals in the wild don’t have someone mowing the lawn for them, do they? Here’s what you need to know: animals need easy access to food and water. Those are the two most essential elements for the animals, and they will benefit the hunters, too; a water source not only looks lovely, but it also provides more opportunity for hunting. What You Need to Do for Land Management: Many owners of hunting land will have a wildlife official come out to assess the property regarding necessities for animals. What they’ll usually suggest is that you create paths for the animals to walk through, as well as “bedding.” In nature, these things will naturally happen. The more you can prepare your Ohio hunting land for sale, the easier you’ll keep game on the property. Pro Tip: Don’t over-cut. You want to create paths for the animals; however, if you remove their cover, they won’t be willing to walk freely. That means you won’t be able to hunt. Next Step: Assess your land for a water source, food, and proper cover for animals. You may want to contact your local Private Lands Biologist to get advice on managing your hunting land; they can determine a suitable conservation program to best suit your particular wildlife and land. To allow people to hunt properly, certain things are necessary to build on your hunting land for sale. While you don’t want to go and build a 3-story walk-up in the middle of your hunting land, you do want to be prepared to do a little bit of building. What You May Want to Build On Your Land: When it comes to the “what” of building management, you will want to be methodical about that. You should decide right off the bat what you think land buyers would want your property to have. Will you build a cabin or two for extended stays? How many (if any) tree stands will you have? The sooner you can decide, the sooner you can build it all at once and allow people to get to hunting. 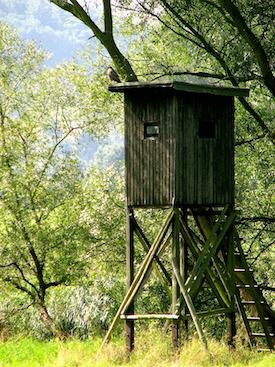 Pro Tip: Most hunters will want some kind of tree stand or blind. That does not mean that you want to build a ton of them and disturb your land. Be strategic; it’s better to build them now and increase the value of your hunting property. Next Step: Determine, based on size and location, what kind of animals people will hunt, and what you need to build on your hunting land (e.g., tree stands, blinds, or cabins). Remember, your available hunting land will show little return if it’s not properly managed. Don’t neglect it, and buyers won’t neglect you. Ohio Department of Natural Resources (ODNR) Division of Wildlife offers a wealth of information on their site for landowners, as well as hunters, in general. You will find resources regarding obtaining licenses, Ohio hunting regulations, finding a Private Lands Biologist, and so much more. ODNR even has a Turn In a Poacher, or ”TIP,” program, designed to allow the public to report wildlife violations in an effort to stop poaching throughout Ohio. On the “Hunt” for a Seasoned Real Estate Firm? Let us leave you with one last tip: Remember, hunting land must be cultivated; it doesn’t naturally happen on its own. There are specific elements that you need to make your land prosperous. Learn which ingredients make the perfect hunting land for sale. Now that you have an idea of what hunters (and animals) want and need out of Ohio hunting land that’s for sale, you may feel ready to cash in on your investment. Where can you go to receive expert advice? With 80 years of experience in Central Ohio real estate, The Robert Weiler Company is ready to assist you with making the right decisions for your Ohio hunting land for sale. Contact one of our expert land brokers at 614-221-4286 for a free consultation, today.